Hastings United’s footballers made it four consecutive wins and clean sheets with a narrow victory this afternoon (Sunday). 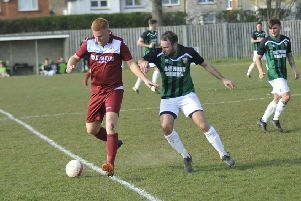 A first half strike from central defender Jerrome Sobers was enough to give United a hard-earned 1-0 success away to a spirited Guernsey in Ryman Football League Division One South. The result moved United above Lewes to seventh in the table, and they are now just two points and two places outside the play-off spots with a vastly superior goal difference than all of the teams around them. Ryan Nicholls was in goal for United, who welcomed back Matt Bodkin from suspension and gave a start to Bradley Stevenson following his impressive display as a substitute against Three Bridges five days ago. United started pretty well at a chilly and breezy Footes Lane. Jack Evans and Sam Cruttwell missed the target before a stretcher was called following an injury to full-back Callum Emptage. Nicholls saved a Guernsey free kick before United grabbed what turned out to be the winner in the 23rd minute. A free kick from the right made its way to Sobers, who seemed to dribble the ball into the net. Guernsey were denied an equaliser when an initial shot hit the post and the rebound was put away only for the offside flag to be raised. Into the second half and Guernsey came close when Dave Rihoy forced Nicholls into a good save. Guernsey put United under pressure during the latter stages, but the visitors held firm to clinch an important victory which takes them past the 60-point mark. United: Nicholls, Emptage (Johnson), Cruttwell, Evans, Sobers, Rowe, Bodkin, Stevenson (Kieran), Harris (Stannard), Collin, Hughes-Mason. Sub not used: Watt. Attendance: 553. Ryman Division One South top 10 (played-points): 1 Tooting & Mitcham United 34-77 (+52 goal difference), 2 Dorking Wanderers 34-74 (+44), 3 Carshalton Athletic 35-67 (+37), 4 Greenwich Borough 33-63 (+29), 5 Corinthian-Casuals 34-63 (+18), 6 Hythe Town 33-62 (+24), 7 HASTINGS UNITED 33-61 (+49), 8 Lewes 34-61 (+6), 9 Cray Wanderers 33-56 (+11), 10 Walton Casuals 36-56 (+5).